Although the Internet is crowded with companies with names similar to ours, there is in fact only one Kensington-Wheaton Lock Service. We are a Licensed and Registered company who have been providing Locksmith services in the Washington DC area for over 19 years. You can verify our outstanding rating in your DC checkbook and rest assured that any door or lock problem will be dealt with professionally and affordably. 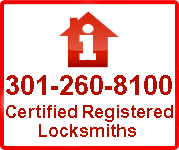 We have become Maryland's highest rated locksmith and work hard to keep it that way. Staffed by certified locksmiths with a minimum of 14 years of experience. Our standards are as high as we can make them because we know that is what our customers want. We respond immediately to emergency situations because we know you are waiting. We guarantee our work because we want you to have as much faith in it as we do. 90 days without question and one year on grade 2. Although we work extensively with property management companies, we enjoy working with residential customers too. So if you need a Locksmith anywhere in the DC metro area, give us a call, we promise you won't be disappointed.